On the last day players can come into the organization and be eligible for the postseason, the Dodgers have acquired minor-league outfielder Justin Ruggiano from the Mariners, along with cash considerations, in exchange for a player to be named later or cash considerations. Ruggiano, who was drafted by the Dodgers in the 25th round of the 2004 draft, has an .899 OPS for Triple-A Tacoma and .678 OPS in 36 games for Seattle. On July 19, 2006, Ruggiano was the player to be named later in a trade that sent Dioner Navarro and Jae Seo to Tampa Bay (and Andrew Friedman) for Toby Hall, Mark Hendrickson and cash. Giants at Dodgers, 7:10 p.m.
Austin Barnes, Mike Bolsinger, Ian Thomas and Joel Peralta are set to be the first additions the Dodgers make Tuesday when the active roster limit expands to 40 players, Don Mattingly confirmed to reporters today. Barnes today was named to the all-Pacific Coast League team at catcher, honoring a season in which he has a .389 on-base percentage and .479 slugging percentage for Triple-A Oklahoma City. Barnes has nine homers, 12 steals (in 14 attempts), 35 walks and 36 strikeouts. As a Dodger this year, he is 4 for 15 with two walks. Bolsinger is coming off seven innings of shutout ball with 11 strikeouts Saturday against El Paso. In 46 2/3 innings with Oklahoma City this season, he has a 2.31 ERA with 61 strikeouts, complimenting his 2.83 ERA with 78 strikeouts in 89 innings for the Dodgers. Thomas finishes his minor-league season with a 4.19 ERA for three different teams, with 58 strikeouts in 58 innings. In the Majors this year, his ERA is 4.11 with Atlanta and Los Angeles. Peralta, who went on the disabled list with a right neck strain August 11 for the second time this year, made three rehab appearances in the past week for Double-A Tulsa, retiring all nine batters he faced. He has a 5.40 ERA in 25 innings this season for the Dodgers. Julio Urias, Corey Seager and Jharel Cotton, who are all in Triple-A tonight, will not join the Dodgers on Tuesday, and no statement has been made about if/when they might be added to the 40-man roster. Update: Kiké Hernandez has been placed on the 15-day disabled list with a strained left hamstring, joining Howie Kendrick and Yasiel Puig. Barnes has been activated to take his roster spot. Julio Urias is bringing his A game to Triple-A tonight. The 19-year-old phenom is being given his first Triple-A test, starting this evening for Oklahoma City against Iowa. 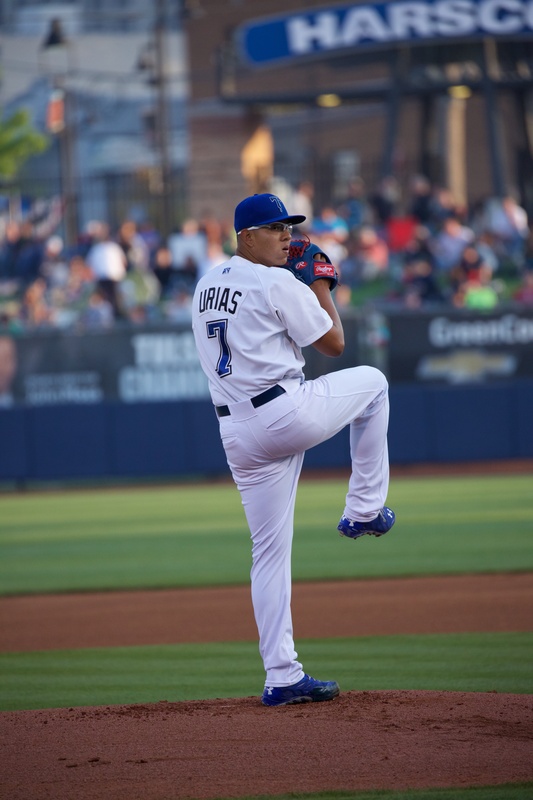 In his most recent outing Wednesday for Double-A Tulsa, Urias struck out eight in six shutout innings, lowering his August ERA to 2.53 and his 2015 ERA at Double-A to 2.77. He has 74 strikeouts against 69 baserunners in 68 1/3 innings. You might notice a pattern with Urias. When he made his professional debut at 16 years and 9 1/2 months with Single-A Great Lakes on May 26, 2013, he pitched three shutout innings. In his first game April 4 for Rancho Cucamonga, he pitched four shutout innings. In his Double-A debut April 10 this year, Urias pitched five shutout innings. Update: Well, it didn’t go well for Urias in his debut. After striking out the first batter and coming within one strike of a perfect inning, Urias allowed three runs on two hits and four walks before getting out of the inning, using 44 pitches. Juan Jaime replaced him in the top of the second. Last year, Hyun-Jin Ryu pitched 152 innings in 26 games at age 27 with a 3.38 ERA. If Brett Anderson allows two earned runs in his first 4 2/3 innings against the Giants tonight, he will have pitched 152 innings in 26 games at age 27 with a 3.38 ERA. It’s enough to make you marvel at what Anderson has accomplished, after totaling 123 innings over the previous three years, and it’s enough to make you rue Ryu’s absence after what he had accomplished the previous two years. Despite the aforementioned similarities, Anderson and Ryu have not been the same pitcher. Anderson has allowed more walks, contact and baserunners, but that surplus hasn’t led to more runs than Ryu allowed, perhaps because of Anderson’s extreme groundball ratio. Ryu made four starts against the Giants in 2014, two of them good. By the time Anderson finishes his fourth start against the Giants tonight, hopefully two of them will have been good. Nine innings without a hit, then nine days, then nine more innings without a hit. That’s the story for the Dodgers, who were no-hit tonight at Dodger Stadium by Jake Arrieta in a 2-0 victory by the Cubs. Barely a week after Mike Fiers no-hit the Dodgers in Houston, Arrieta was magnificent, his 116 pitches darting in and out of the strike zone, striking out 12 and walking only Jimmy Rollins with two out in the sixth. Justin Turner, Rollins and Chase Utley, the same trio that ended the game against Fiers (though in different order), made the final three outs tonight. Turner, in his first at-bat of the night, struck out. Rollins took a called strike three. And Utley, who made the final out in Josh Beckett’s no-hitter and has been involved in three no-hitters in the last nine Dodger games he has played in, struck out swinging. 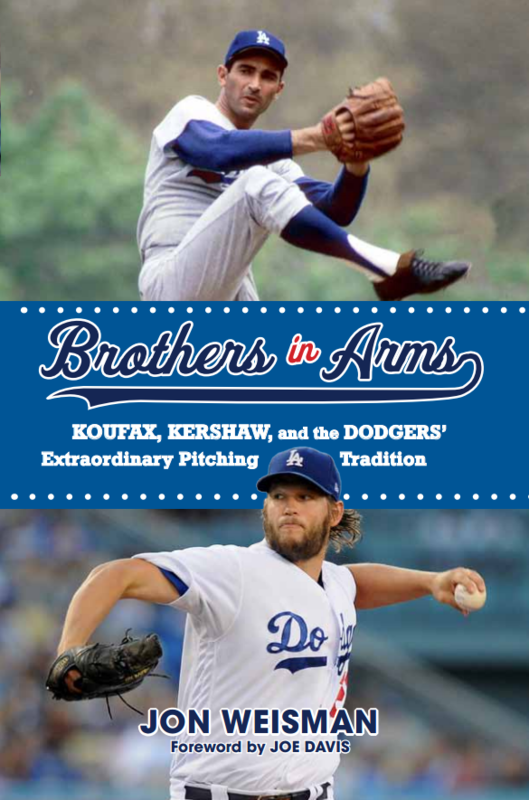 The Dodgers had never been no-hit twice in the same year, and hadn’t been no-hit in consecutive years since Amos Rusie of the New York Giants and Jack Stivetts of the Boston Beaneaters did so in 1891 and 1892. Los Angeles set a National League record for fewest days between no-hitters, according to Mike Petriello. The MLB record occurred when the Chicago White Sox were no-hit on May 5-6, 1917. There have been no-hitters at four Dodger games in the past two seasons. Most recent before that was the six-pitcher no-hitter by Seattle in 2012. That ended a 16-year drought of Dodger games without a no-hitter on either side, dating back to Hideo Nomo’s 1996 Coors Field no-hitter. Kent Mercker pitched the last no-hitter against the Dodgers at Dodger Stadium, in 1994. Beyond the obvious, the frustration for the Dodgers was wasting what turned out to be some resilient pitching. It didn’t start that way: Alex Wood was trailing by two runs after three batters, when Chris Denorfia walked with one out in the first and Kris Bryant homered. Wood struggled through the first three innings, throwing 72 pitches. But he used only 32 pitches over his next three innings, retiring 10 of his last 11 batters. Relief pitchers Juan Nicasio and J.P. Howell generated inning-ending double plays in consecutive innings, as the Dodgers held the Cubs hitless with runners in scoring position tonight (and in the entire series, in fact). Chicago had 13 hits, two walks and 12 left on base. 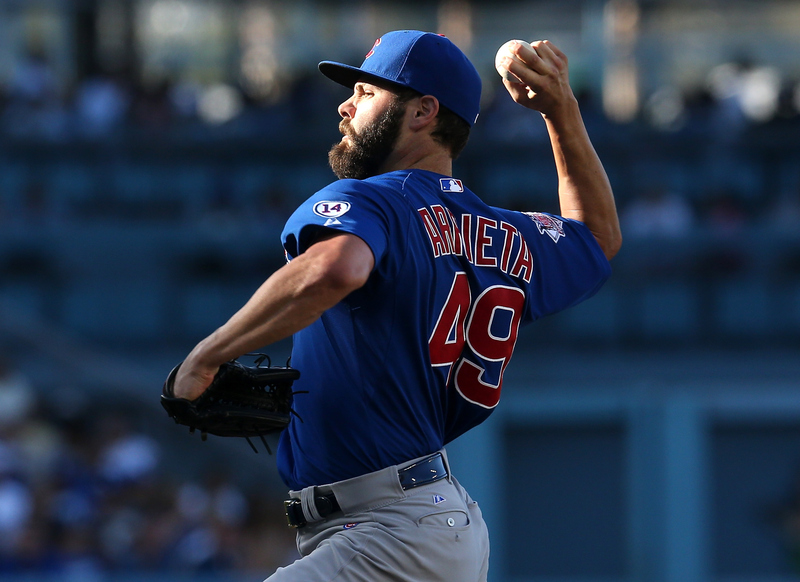 Cubs at Dodgers, 5:08 p.m.
Jake Arrieta might be the top National League Cy Young Award contender outside of Zack Greinke and Clayton Kershaw. But if the Dodgers can top him tonight, they’ll have a 4 1/2-game lead in the NL West, which would be their biggest since July 12. San Francisco, which lost to St. Louis today for the second consecutive time this weekend, arrives in Los Angeles on Monday for a highly anticipated three-game series. Arrieta has a 2.22 ERA, putting him in second place in the NL between Greinke (1.61) and Kershaw (2.24). The 29-year-old righty is fourth in the NL in wins above replacement (4.9), behind Kershaw (6.6), Greinke (5.1) and the slumping Max Scherzer (4.9). In xFIP, Arrieta is in second place behind Kershaw. 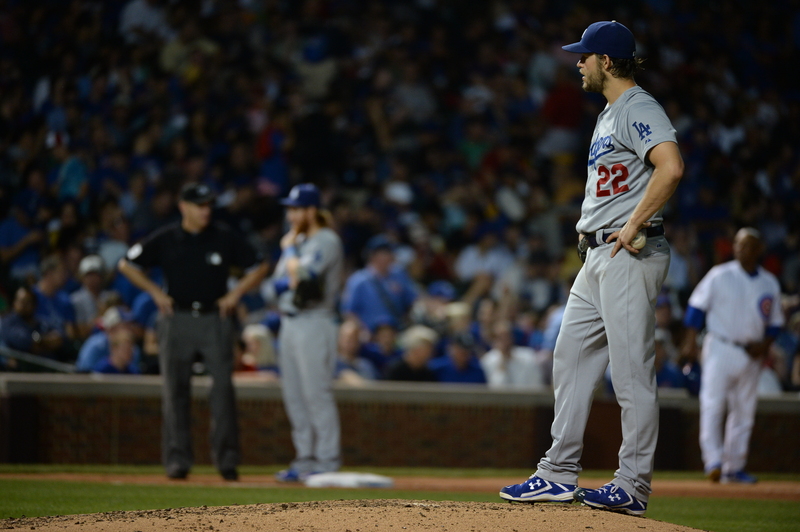 Like Kershaw, Arrieta has heated up with the heat. He has a 1.17 ERA with 89 strikeouts in 92 innings since June 21, and in fact, enters tonight’s game as the frontrunner for NL Pitcher of the Month honors (33 1/3 innings, two earned runs, 0.54 ERA, 31 strikeouts). 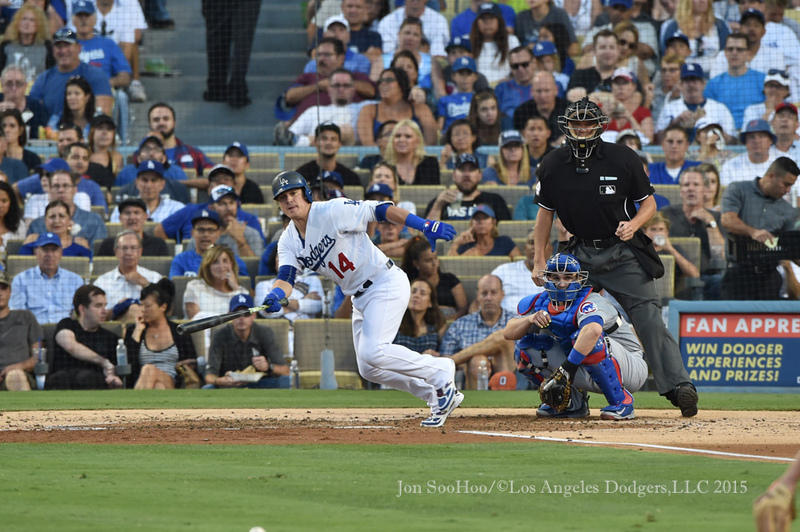 The Dodgers counter with Alex Wood, who has allowed 27 hits with 14 walks in 29 innings as a Dodger. Wood allowed one run in 5 2/3 innings in his last start. A win tonight would also tie the Dodgers with the Cubs for the third-best record in the NL: 73-56. 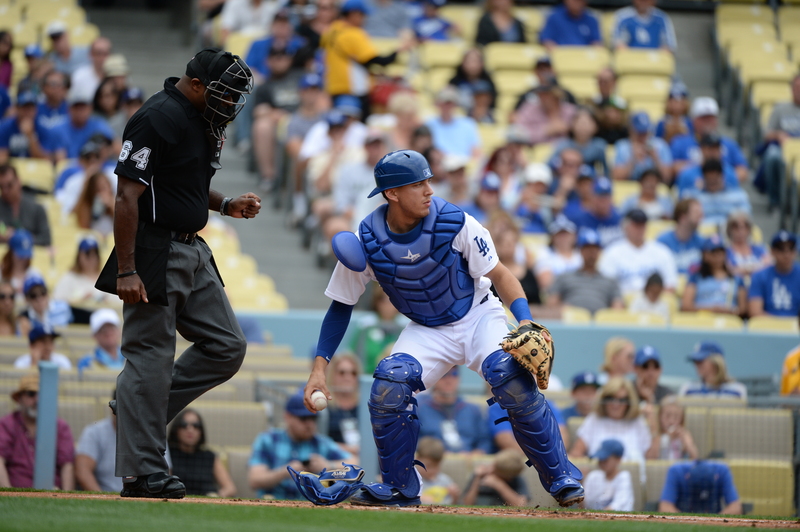 Kiké Hernandez is getting his first official start for the Dodgers at third base tonight. Eric Stephen of True Blue L.A. beat me to the punch on this, so I’ll just crib from him: Hernandez is the first Dodger to start at second, short, third and all three outfield positions in the same year since Bobby Valentine in 1972. Hernandez’s experience at third has been limited to 14 2/3 Major League innings and 25 minor-league games, but he has taken grounders there during the season and played there in winter ball, according to Don Mattingly. Since July 24, Hernandez has a .397 batting average, .443 on-base percentage and .589 slugging percentage. Hernandez will be batting behind Joc Pederson, whom as ESPN’s Buster Olney pointed out, is on the verge of a unique month in baseball history. No player with at least 20 walks in any calendar month has had fewer than the seven hits by Roger Maris in August 1959, but with two games to go in August 2015, Pederson is at 21 walks and five hits. Maris went 7 for 79 with 20 walks in August 1959, at age 24. That winter, he would be traded to the Yankees, for whom he would win American League Most Valuable Player awards in 1960 and 1961, hitting 100 home runs. Cubs at Dodgers, 6:10 p.m.
Mat Latos makes his fourth start for the Dodgers tonight, and first since August 13. Latos’ first outing for Los Angeles was solid in how he allowed only one run over six innings August 2 to the Angels, but that was with one strikeout. That was followed by a strikeout-free four innings August 8 at Pittsburgh. Against the Reds on August 13, Latos struck out seven and allowed no hits in the first two innings, but Cincinnati racked up five runs (four earned) and seven hits over the next 2 2/3 frames to knock Latos out. Pitching against the Cubs on July 5 while still with Miami, Latos threw seven innings of one-hit ball, walking two, hitting one and striking out seven. Vin Scully apologized, unnecessarily of course, for being two minutes late to his press conference today to discuss his return to the Dodgers in 2016, citing an accident near De Soto Avenue on the Ventura Freeway. Then came the words that made everyone who adores him slam on their brakes: that 2016 would likely be his last season. August 22, 2013: Vin Scully announces return, Dodgers win, 6-0. 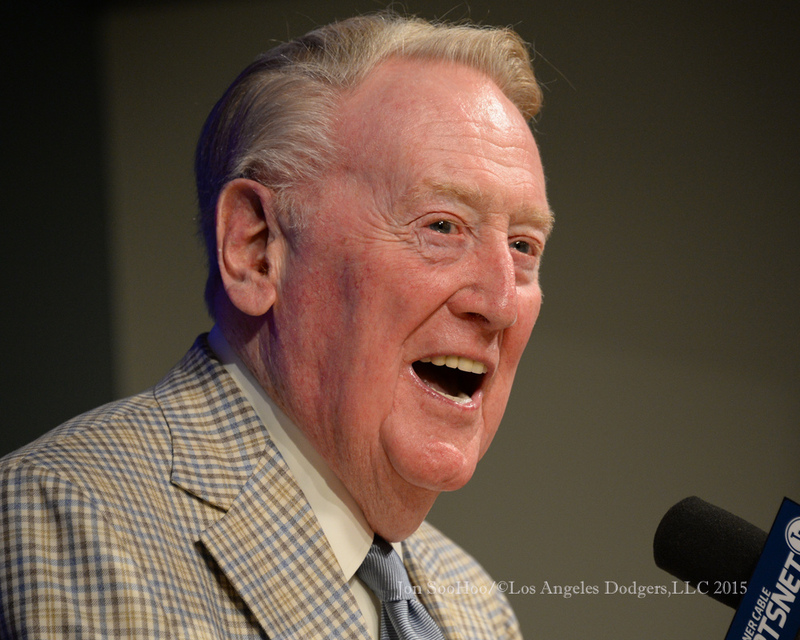 July 29, 2014: Vin Scully announces return, Dodgers win, 8-4. 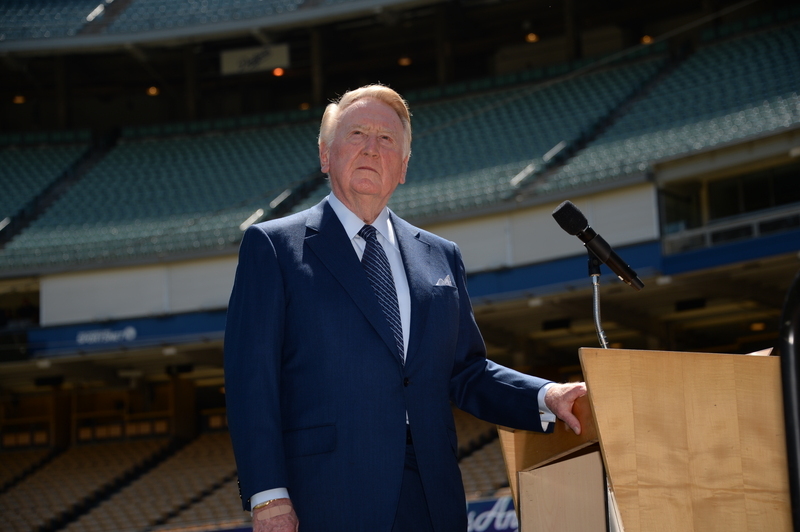 August 28, 2015: Vin Scully announces return, Dodgers win, 4-1. I do see a trend, though it hasn’t hurt to have Clayton Kershaw on the mound for two of those three games. Tonight, Kershaw tied a season high with 14 strikeouts — one shy of the career high he set in his June 18, 2014 no-hitter — in the Dodgers’ third victory over the Cubs in five meetings this year. Kershaw allowed a fourth-inning home run to Anthony Rizzo that tied the game at 1, but then retired the next 10 batters he faced, striking out seven, and didn’t surrender a hit the rest of the game. He threw 108 pitches in his eight innings of work. Though Kershaw had his 31-inning home scoreless streak broken, the big lefty finished August with a 1.24 ERA and 51 strikeouts in 45 innings. He is the first Dodger pitcher to have at least 50 strikeouts in August since Hideo Nomo in 1995, according to Baseball-Reference.com. 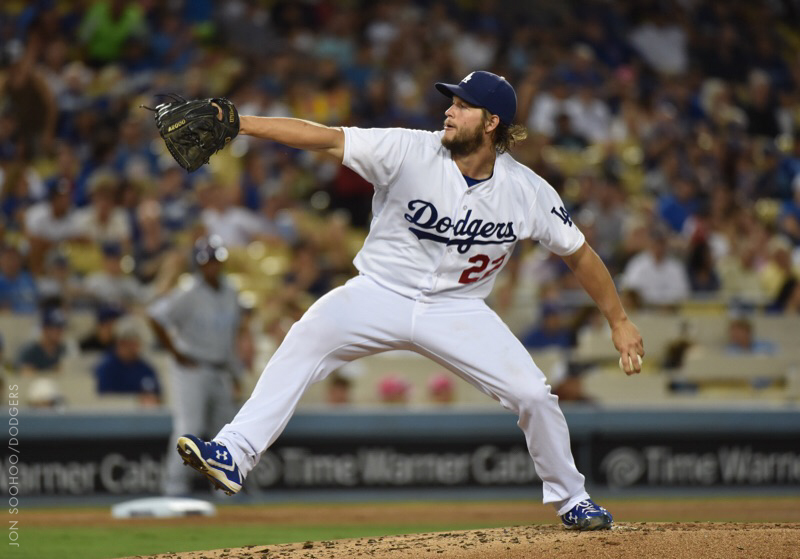 Since May 26, Kershaw has a 1.28 ERA with 163 strikeouts in 126 2/3 innings. Chase Utley, who tripled in the Dodgers’ first run (his first RBI with his new team) in the third inning, scored the go-ahead run from second base in the sixth on a wild pitch and throwing error. Los Angeles pushed across two more runs in the inning for breathing room. With a reveal in the second inning of tonight’s Dodger game, Vin Scully has officially announced he will return to the Dodgers broadcast booth for his 67th season in 2016. If you date the franchise back to its American Association roots in 1884, Brooklyn played 66 seasons before Scully’s arrival, and Brooklyn-Los Angeles has played 66 seasons since. Cubs at Dodgers, 7:10 p.m. Even with rosters expanding in four days, obviating the need to use the disabled list, the Dodgers are convinced enough that Yasiel Puig’s latest hamstring injury will sideline him for long enough to put him on the 15-day disabled list. Rather than play a man down between now and Tuesday, the Dodgers have called up infielder-outfielder Jose Peraza, who has a .316 on-base percentage and .378 slugging percentage in Triple-A this year, in addition to having a walk and a triple in seven plate appearances for the Dodgers this month. The timing for Puig’s injury is a drag, considering that he has a .975 OPS over his past 12 games and also keeps opposing baserunners at bay with his arm. 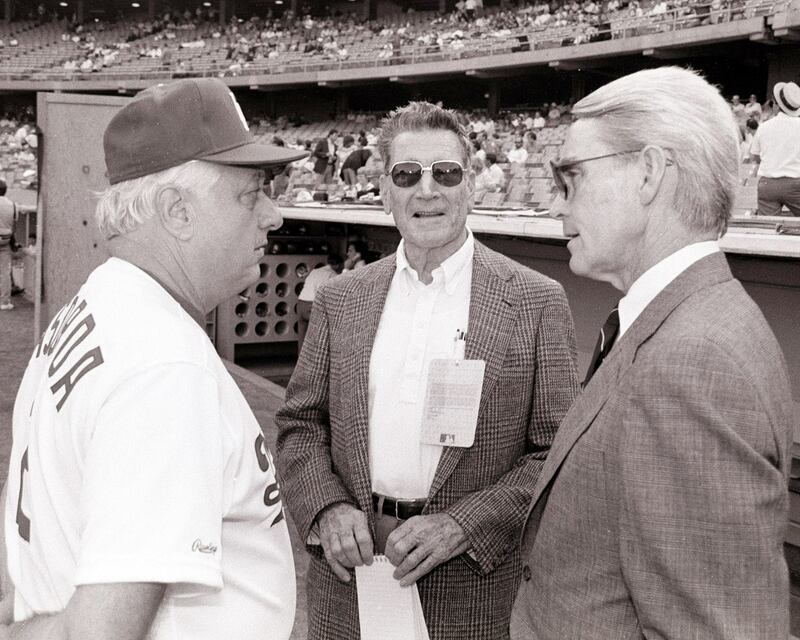 Hall of Fame manager Tommy Lasorda will receive the Jim Murray Memorial Foundationʼs “Great Ones” trophy, a bronze bust of Pulitzer Prize winning writer Jim Murray. Lasorda is being honored for more than 60 years of meritorious service in the Dodger organization. Previous winners include Arnold Palmer, Joe Namath, Luc Robitaille, Bobby Rahal, Chris McCarron, Duke Snider, Sugar Ray Leonard and Rick Reilly. The JMMF was established by Linda Murray Hofmans in 1999 following the passing of the longtime Times columnist. The foundation awards journalism scholarships to the nation’s top college journalists through a national essay competition. To date, the JMMF has awarded 99 scholarships totaling over $500,000. With temperatures in the 90s as a greeting, the Dodgers are preparing to host playoff contenders from Chicago and San Francisco over the next six games. Some would call this the Dodgers’ biggest test of the year to date, though Los Angeles already played the Giants and Cubs in back-to-back series in June. The Dodgers went 3-4, which I would call a bogey, though it’s worth noting Clayton Kershaw and Zack Greinke pitched in only two of those seven affairs. Giants 9, Dodgers 5 (June 19): Mike Bolsinger allowed a grand slam to Buster Posey in the third inning, while Daniel Coulombe and Josh Ravin combined to give up four more runs in the seventh. Giants 6, Dodgers 2 (June 20): Carlos Frias allowed six runs in 5 1/3 innings. Dodgers 10, Giants 2 (June 21): Yasmani Grandal hit two of the Dodgers’ four homers in support of Brett Anderson. Cubs 4, Dodgers 2 (June 22): The power-outage game, in which Clayton Kershaw allowed a tiebreaking, seventh-inning home run to Matt Szczur. Cubs 1, Dodgers 0 (June 23): Zack Greinke pitched six shutout innings, but in his first game in two months, Joel Peralta took the loss in the 10th. Dodgers 5, Cubs 2 (June 24): Justin Turner hit a three-run home run, and the bullpen pitched 5 1/3 shutout innings in relief of Bolsinger. 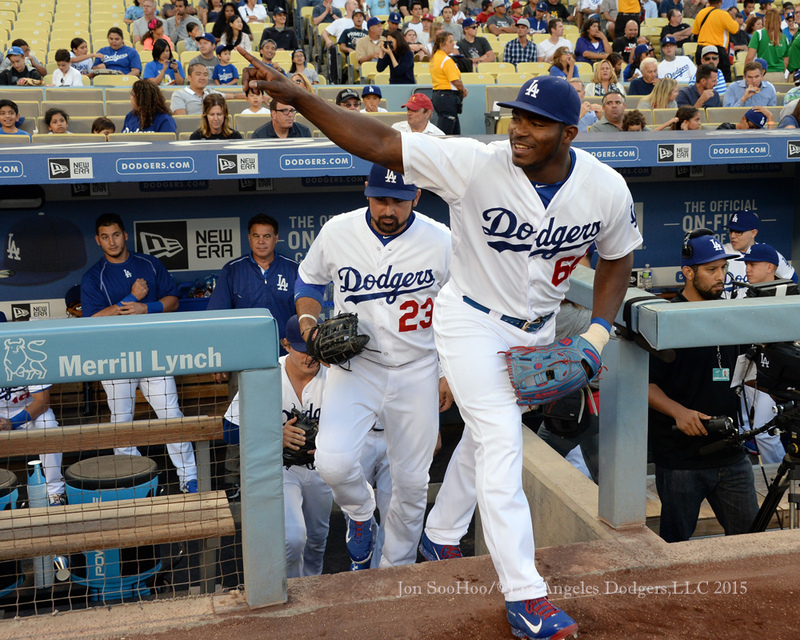 Dodgers 4, Cubs 0 (June 25): Four more shutout innings from the bullpen after Frias goes five. It was an unpredictable stretch, to say the least, and you can judge for yourself the good or bad of going 3-4 without getting a victory from Kershaw or Greinke. In any case, here we are again with the Cubs and Giants, but this time at home, and this time with Kershaw or Greinke pitching half the games. a 0.90 ERA with 82 strikeouts and seven walks in 70 innings since July 1.
a 1.29 ERA with 149 strikeouts and 16 walks in 118 2/3 innings since May 26. 28 consecutive scoreless innings at home. And, Kershaw and Greinke currently have two of the top 10 single-season Dodger Stadium ERAs ever. After Kershaw pitches tonight, it’s Mat Latos, Alex Wood and Brett Anderson scheduled to go Saturday-Monday, before Greinke and Kershaw finish the homestand off. 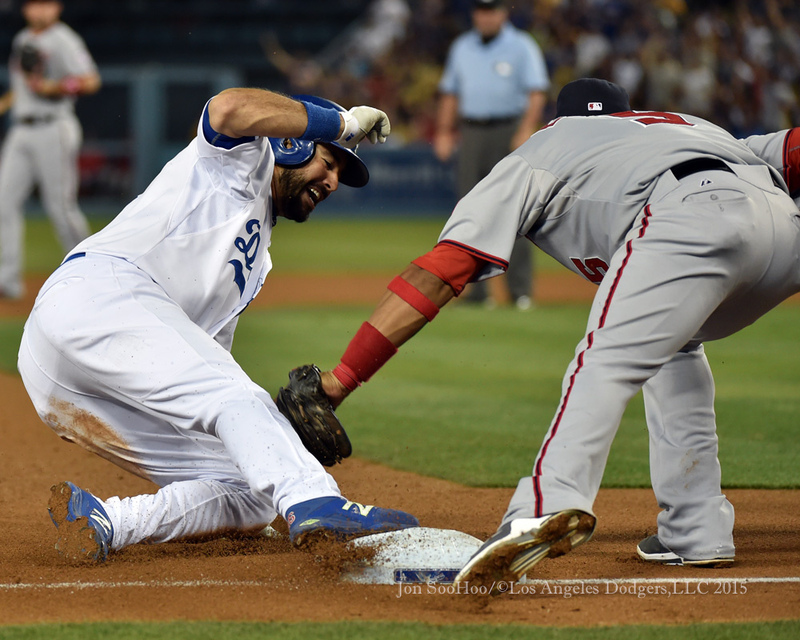 Why does the Dodger offense, talented as it is, seem to be underperforming? Jeff Sullivan offers a sound analysis at Fox Sports’ Just a Bit Outside. The conclusion might seem mundane unless you go through his process, so I recommend you read the entire story. Update: Cincinnati slugger Joey Votto has given some words of encouragement to Dodger rookie Joc Pederson when the two have met at first base, writes Pedro Moura in this nice piece for the Register.